Christopher Columbus was an explorer, colonizer, and navigator, born in the Republic of Genoa, in what is today northwestern Italy. He is well known for his discovery of the American continents. Italian’s love their butter, so I thought you would enjoy this recipe. Instructions – Combine in a glass container. Let sit at room temperature (around 70 degrees) at least 8 hours and up to 24. It is done when the cream is very thick. Can be refrigerated about a week if not used immediately. 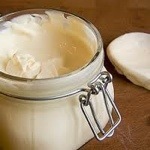 Take the crème fraîche out of refrigeration 45 minutes or so before you start so it gets close to room temperature. Fill a bowl with 3-4 cups of water. Add ice so the water is cold. Set aside. Put the crème fraîche in the food processor with the blade attachment, a stand mixture with the whisk attachment, or in a glass canning jar with a lid. All three work equally well. The benefit of using a food processor is that it is the fastest method and liquid won’t splatter everywhere like it will with a stand mixer. Manually shaking a glass jar builds a workout into the recipe, but takes longer. To make the butter, process or whisk the crème fraîche for about three minutes, sometimes a bit longer. If you’re using a jar, shake for as long as you need to. With each method, the mixture will begin to thicken and look like whipped cream, then it will thicken even more and start turning a pale yellow color. At this point, buttermilk will begin separating from the butter. Taste the butter. It will have a sour quality, which is from buttermilk that has not separated out yet. To give the butter a purer flavor, it must be rinsed. Use a spatula to scrape the butter into a bowl. Add 1/2 cup of ice water and mash the butter and water together with a fork for about 30 seconds. The butter will repel the water, not soak it up, and the water will clean off any remaining buttermilk. Pour the liquid (which will be cloudy) out of the bowl. Continue this process, 4 or 5 times, until the water no longer becomes cloudy. Continue mashing the butter with a fork and pour out any last bits of liquid it releases. Stir in sea salt to taste if desired. 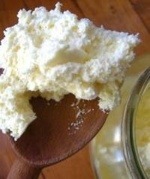 To Make Flavored Butter – If you are making a compound butter, mash the ingredient in with the butter now. Consider adding bacon or prosciutto bits, minced herbs, spices (try curry powder, paprika or red pepper flakes), minced garlic, cinnamon, lemon zest. 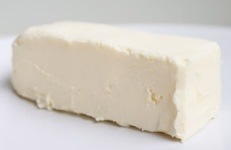 How to Store – Wrap the butter in wax paper and shape it into a log, or fill a small container with the butter. Keep the butter well covered in the refrigerator and use within a week or so. You can also freeze the butter for future use by wrapping in plastic wrap and put in freezer bag.